While organized labor has experienced a steady erosion in membership in recent decades, it is still a vital constituency for Democrats in particular. Many of the larger and more active national labor unions put on candidate forums where the candidates can come and speak to hundreds of active members. Candidates can also speak at meetings or events put on by a union's state affiliates, and they may make their cases out of the public eye to a union's executive board. Unions seek to educate members about the candidates and issues as part of their endorsement processes, and seek members' feedback through questionnaires, surveys and focus groups. Mostly it is the Democratic candidates engaging the unions, but about a third of union members are Republicans so one occasionally finds a Republican candidate or campaign reaching out to a union. In early March 2008 the AFL-CIO launched a "McCain Revealed" section on its website. Sen. Obama met with the leadership of the AFL-CIO and other major unions at AFL-CIO headquarters on June 18, and on June 26 the AFL-CIO voted to endorse him. Sen. Barack Obama (D-IL), Sen. Hillary Clinton (D-NY), and former Sen. John Edwards (D-NC) are scheduled to participate in an "American Dream Dialogue" during Change to Win's 2nd Biennial Convention at the Chicago Hilton in Chicago, Illinois on September 25, 2007. Change to Win endorsed Sen. Obama on Feb. 21, 2008.
International Brotherhood of Teamsters | Laborers' International Union of North America | Service Employees International Union | United Brotherhood of Carpenters and Joiners of America | United Farm Workers of America | United Food and Commercial Workers International Union | UNITE HERE. www.WalkADayInMyShoes2008.com The SEIU launched its "Walk a Day in My Shoes" campaign on January 30, 2007. The idea is for presidential candidates to accompany SEIU members at home and on the job. The website noted that "'Walking a Day in My Shoes' is a prerequisite to being considered for our endorsement." In the January 30 press release, SEIU President Andy Stern is quoted, "If presidential candidates understand the struggles workers face each day, they will be better able to offer the solutions this country needs." April 11, 2007 - Former Sen. John Edwards (D) became the first candidate to "Walk a Day," accompanying CNA Elaine Ellis at the Sarah Neuman Center for Healthcare and Rehabilitation in New York. June 7, 2007 - Gov. Bill Richardson (D) went to work with Mark Fitzgerald, a case worker for the Clark County Department of Family Services, in Las Vegas, NV. July 26, 2007 - Sen. Chris Dodd (D) assisted Head Start teacher Colleen Mehaffey with her classroom activities in Cedar Rapids, IA. Aug. 8, 2007 - Sen. Barack Obama (D) assisted homecare worker Pauline Beck as she cared for her 86-year-old client at his home in East Oakland, CA. Aug. 13, 2007 - Sen. Hillary Rodham Clinton (D) joined Las Vegas nurse Michelle Estrada during her shift in a medical/surgical unit. Aug. 29, 2007 - Sen. Joe Biden (D) assisted Marshall Clemmons, the head custodian for Harding Middle School in Cedar Rapids, IA. scheduled for Sept. 7, 2007 - Former Gov. Mike Huckabee (R) at the Youth Development Center in Manchester, NH and the Women's Prison in Goffstown, NH. www.rudy-urbanlegend.com International Association of Firefighters Interested in Registration and Education Political Action Committee. 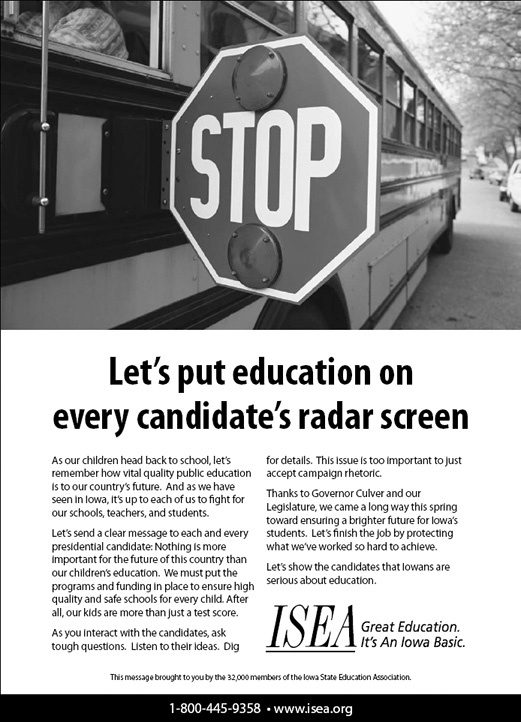 Aug. 19, 2007-Press release: "Democrats Running for President Reject Using Test Scores To Pay Teachers"
Aug. 18, 2007-Ad: run by the ISEA in the Des Moines Register. June 5, 2007-Press release: "Republican Presidential Debate Fails to Focus on 'No Child Left Behind'"
April 26, 2007-Press release: "NEA Applauds Plan by Gates, Broad Foundations to Prompt National Dialogue on Education." April 25, 2007-Press release: "South Carolina Teachers Challenge Democratic Candidates to Make Public Education Top Domestic Priority." Sept. 17-18, 2007...Five of the major Democratic candidates are scheduled to speak at the Laborers' International Union of North America (LIUNA) Leadership Conference in Chicago, IL. Sept. 17, 2007...Five of the major Democratic candidates spoke at the Service Employees International Union (SEIU)’s Member Political Action Conference in Washington, DC. Aug. 27-28, 2007...International Association of Machinists and Aerospace Workers (IAM) hosted candidate conversations at National Staff Conference in Orlando, FL. Aug. 7, 2007...AFL-CIOPresidential Candidates Forum held at Soldier Field in Chicago, IL. July 5-6, 2007...Four Democratic candidates spoke at the United Steelworkers (USW) Presidential Candidates' Forum on Renewing American Manufacturing at Crowne Plaza Cleveland City Centre Hotel in Cleveland, OH. July 3-5, 2007...Eight presidential candidates (seven Democrats and one Republican, former Gov. Mike Huckabee) addressed (2) the National Education Association (NEA)'s Representative Assembly in Philadelphia, PA.
June 19, 2007...American Federation of State County and Municipal Employees (AFSCME) Democratic Presidential Forum moderated by MSNBC's Chris Matthews, part of AFSCME's 2007 National Leadership Conference, at Marriott Wardman Park Hotel in Washington, DC. May 15-16, 2007...Five of the candidates spoke at the American Federation of Teachers (AFT)'s regular quarterly executive council meeting, held at the National Labor College in Silver Spring, MD. The executive council comprises the three general officers and 37 vice presidents of the AFT. In addition, members of the policy councils and staffers were also in the room, for a total of about 150 people. Biden appeared on May 15 and Edwards, Richardson, Obama and Clinton on May 16. Dodd had been scheduled to appear first on May 16 but votes in the Senate intervened; he and other candidates, including Republicans, are to be invited to the next meeting in July. Prior to the meeting, the union had asked members to submit questions for the candidates through a "You Decide 2008" section of its website. Members submitted hundreds of questions; the staff broke them down into categories and selected seven; members then voted on the three winning questions. Each candidate had about an hour before the executive council, during which the spoke for 10-15 minutes, responded to the three winning questions asked by the AFT members, and took questions from executive council members around the table. AFT sent out a questionnaire to the candidates the week of May 21st. March 28, 2007...The Building and Construction Trades Department, AFL-CIO held a presidential forum on the final day of its 2007 Legislative Conference in Washington, DC. March 27, 2007...Sens. Clinton and Obama addressedTeamsters General Executive Board. March 24, 2007...Service Employees International Union (SEIU)/Center for American Progress Action Fund "New Leadership on Health Care: A Presidential Forum" at UNLV in Las Vegas, NV. March 14, 2007..."IAFF Bipartisan 2008 Presidential Forum" during International Association of Fire Fighters (IAFF) Legislative Conference at the Hyatt Regency Hotel in Washington, DC. Feb. 25, 2007...American Federation of Government Employees (AFGE) Legislative Conference in Washington, DC. Feb. 21, 2007...American Federation of State County and Municipal Employees (AFSCME)-sponsored forum in Carson City, NV. Jan. 26-27, 2007...Many of the Democratic candidates appeared before the Service Employees International Union (SEIU) executive board during its meeting at Gallaudet University in Washington, DC. Aug. 18, 2007...Hawkeye Labor Council, AFL-CIO Workers for a Better Iowa at Hawkeye Downs Expo Hall in Cedar Rapids, IA. Aug. 15, 2007...Iowa Federation of Labor, AFL-CIO Presidential Forum at the Five Sullivan Brothers Center in Waterloo, IA. -Former Sen. John Edwards did perhaps more than any other candidate to cultivate organized labor in the several years leading up to the 2008 campaign. On Dec. 8, 2007, the AFL-CIO awarded him its Paul Wellstone Award. Jan. 11, 2007-Change to Win press release on the DNC's selection of Denver to host the 2008 Democratic National Convention. March 8, 2007-Statement by the AFL-CIO Executive Council on Colorado's Working Families.